Istralandia is a water park located in Brtongla in Croatria. 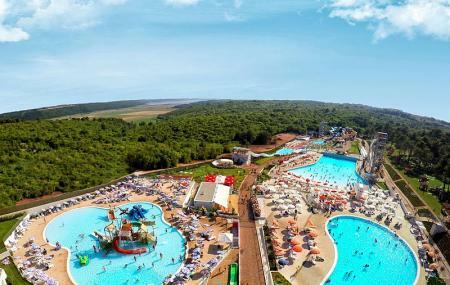 Spread over the area of 80,000 square metres, this park is the first Croatian water park. This park has won many awards for its designs and activities that it offers. This park is located 5 kilometres from the seashore making it an ideal family destination. You can enjoy over 20 slides here that offer abundance of relaxation and excitement. Slides like Free Fall, Flying Boats, Top Gun, Crazy Hills, Family Rafting, Space Rocket are perfect for the adventure junkie in you. Ou find many food courts and gift shops here. Make your visit suitable to your interest, use Brtonigla trip planner for personalization. You can add cozy hotels in Brtonigla like B&b Al Merlo Olivo, Guesthouse Gala, Apartments And Rooms Degra and Apartments & Rooms Barbara. Find out how to reach Brtonigla to begin with. Plenty of wholesome Brtonigla vacation packages are available to choose from, pick your today! Love this? Explore the entire list of places to visit in Brtonigla before you plan your trip. Fancy a good night's sleep after a tiring day? Check out where to stay in Brtonigla and book an accommodation of your choice. Main Istrian water park. It is nice for kids and adults. In high season it is probably best to visit it on Saturday or maybe Sunday. This is time when all tourist are coming to Istria or going home. A very nice aquapark. The ticket's price aren't expensive and the aquapark offers a lot of attractions for the whole family! I recommend it! We had our summer vacation in Croatia and my friends brought us here in our last day. We stayed the whole day with perfect summer weather. Everything is clean and enjoyable. We did a lot of rides and we were overwhelmed. Food and drinks are really good price and delicious. Staffs were very approachable and kind! Our first experience in Aquapark Istralandia was unforgettable. Absolutely lovely place. Whole park is build in a hill, but it’s perfect. For small money on top of ticket you can book an umbrella with two beds, as we did as a family with 2 small boys. We parked ourselves just by kids pool, which was best place for our kids. Park contains many various attractions which should suites to everyone. We visited on a weekday, when park was maybe from half full, but on weekends might be crowded.